From the mountains of Montana, Brianna and Lorne’s friends and family set sail to the lush dreamscapes of Kauai. The vast crevasses of Kauai’s warm canyons surely cannot measure the amount of love shared between these newlyweds! Flourishing with an array of richly colored blossoms, Kauai complimented their vibrant, glistening love. The magic that filled their hearts was emulated with the vibrancy of Kauai’s splendor. On Kiahuna Beach, a charming seascape unfurled, brimming with the native, leafy Naupaka flowers and rustic black lava rocks. This became nature’s garnished backdrop for Brianna and Lorne to declare their love. Only a chosen few determine Kauai to be the haven of which they appoint their marriage to transpire making their special day memorable for a lifetime. Engagement session at the Andaz Wailea. Engagement photos are a wonderful way to announce your big news to friends and family, but what about capturing that exciting moment of popping the question as well? Surprise engagement photo sessions are a fabulous way to commemorate the new milestone in your relationship. With the emotion and excitement in front of our lens, allow us to capture the love and commitment behind it. Here are a few tips from the artists of Coral Weddings to ensure a successful and fun surprise engagement photo session! Get in touch with your photographer before the session. There are typically two options to go about booking your surprise engagement photo session. You can either 1. Have the photographer hide while candidly capturing you two during the proposal or 2. Book the session as planned activity for the two of you and then surprise your partner during the photo shoot! Engagement session at the Fairmont Kea Lani, Maui. There are pros and cons to either option. If you go with the candid surprise, the photographer will be able to capture an organic reaction of the proposal with an intimate setting. Make sure that you let your photographer know what you will be wearing (maybe even send them a photo of what the two of you look like) and be sure to know where the photographer will be hiding. As a planned activity, your partner will be able to be prepared for getting their photo taken. Either way, it’s a promising surprise! Enjoy your session and have fun! Being in the moment with your loved one will provide for a natural session where you can both be comfortable in front of the camera and enjoy your memorable moment. Everyone loves a good engagement story. I personally find them so entertaining and endearing because every single one is unique. While asking someone to spend the rest of your life with you puts you in a very vulnerable state, the romance behind the question itself is full of eternal love. Here in Hawaii, we're always surrounded by Aloha and there's something about the islands here that provide the perfect romantic environment for residents and visitors alike. Which is why it's no surprise as to why Hawaii is one of the most popular locations for popping the question! 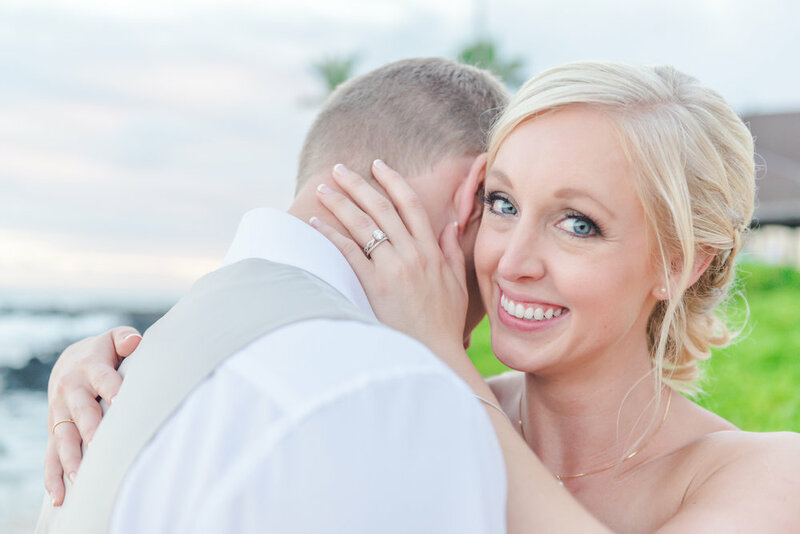 When I met Ben, he came into our Fairmont Orchid studio one afternoon with a contagious energy and I was immediately drawn into his plea for help with a proposal he had been planning for his girlfriend. Of course I said yes and began asking him for his ideas that he had in mind for this special moment. “Have you ever been to the top of Mauna Kea Summit?” he asked with a big smile. Twenty-four hours later, I was on my way up to the snow kissed volcano 13,802 ft. above sea level. I met Ben and Virginie at the visitor’s center about half way up the mountain so we could become acclimated to the climate and avoid elevation sickness. Ben told Virginie that he had scheduled a couples photo session with us at the top of Mauna Kea. Virginie, a lover of photography and modeling, didn’t know that Ben had something even more special planned for their trip to the mountain. During the sunset and above the cotton candy clouds, Ben got down on one knee and popped the question. It was an exhilarating moment with a breathtaking view, a moment that the three of us will remember forever. Who was she? How could I talk to her? Was she single? I stole one more glance hoping she wouldn't notice I was creeping. She smiled at me. Little did I know, my world was about to be spun around and turned completely upside down. One day, she even told me: "I love you to the moon and back and forth." I loved the French twist on the English idiom so much that the "and forth" stuck. It was a little challenging to figure out how to propose.... Virginie doesn't wear jewelry, doesn't care for diamonds, doesn't love rings, and isn't big on cliches. The observatories at Mauna Kea, at nearly 14,000 feet above sea level, is as close to the moon as you can get in Hawaii. Her ring shows the Earth and the moon in an infinity loop.... going back and forth, back and forth, and back and forth again. In broken French, I asked her to marry me. She said "oui." Nestled on the coast between the Kohala Mountains and Hualalai volcano, lies the Fairmont Orchid, Hawaii, an oasis of tranquil paradise. The Big Island of Hawaii calls to those that share a passion for adventure, outdoors and seclusion. If you’re looking to have your destination wedding in Hawaii, the beautiful Fairmont Orchid, Hawaii is where you can experience the untouched culture of the islands. We had the pleasure of sitting down with MewLan Seto, wedding and event planner extraordinaire of the Fairmont Orchid for over the past six years. With family roots from here on the Big Island, MewLan tells us what makes this location irresistible to brides and grooms. What separates the Fairmont Orchid from the other venues in the area? We have incredibly unique beachfront locations here on property. For the bride and groom that are looking for the toes in the sand experience or a soft manicured lawn, both locations we offer have gorgeous sea to summit views. They're both equally large enough to hold weddings and receptions right on the beach. I think that’s what most couples really envision for a Hawaiian wedding. What sort of experience can a bride and groom expect when booking a wedding here? We have such a warm and welcoming staff here on property. Everyone is one big ‘Ohana (family) and we treat our guests as if they’re walking into our home. Weddings are such a special treat for us to be a part of and we like to show our clients the importance that holds. We love to pamper our brides and grooms with surprise gifts from arrival to check out. What makes the Big Island stand out from the other islands? The Big Island is for those that seek adventure yet peace and quiet. There are so many various activities available such as whale watching, visiting the active volcano, and hiking to remote beaches, I think there is something for everyone here to enjoy. With exquisite culinary art from locally grown produce, a visionary design team, and a picture worthy view, the Fairmont Orchid remains a top pick for destination weddings here in beautiful Hawaii. As a general word of advice before your big day, make sure you are well rested. With the next day's itinerary lingering over your head, go through your timeline and schedule for the following day to see if there are any last minute details that need to be addressed. This will help put your mind at ease and provide you with a better night of rest. You'll wake up looking and feeling amazing for your wedding day! Make sure you schedule enough time to prepare your hair and makeup. You’d be surprised with how much time it takes to have your hair and makeup professionally done for your wedding. When booking your artists, double check on time with them to allow the getting ready process to flow easily. You don’t want to feel pressed for time! Have a couple of your bridesmaids or family members lend a hand during the shoot. They can keep an eye out for any make up smudges or stray hairs that need to be tended to while you get your photos taken. If you’re having your wedding at one of the beautiful resorts here in Hawaii, use the property to your advantage. Chances are there's a beautiful staircase to show off your long train, a chandelier in the lobby for an elegant feel, or a balcony overlooking the gorgeous Pacific Ocean. Anything colorful and vivid will provide a breathtaking background for your bridal portraits. Don’t overcomplicate your bridal portraits. Make yourself comfortable and relax! Let your personality naturally shine through and have fun! There are few places on the island of Oahu that provide a beautiful and relaxed elegance. The Kahala Hotel & Resort is the romanticized dream of a destination wedding in Hawaii. An ideal venue, the resort is nestled in-between the slopes of Koko Head and Diamond Head craters on the South-East side of the island. While the majority of Oahu Resorts are surrounded by the hustle and bustle of tour busses, throngs of vacationers, and tour guides gathering their groups on the busy sidewalks, the Kahala stands as an oasis. Set back from the city of Waikiki, the Kahala offers tranquility with a backdrop of pristine Hawaii landscapes. Perhaps it is this feeling of intimacy that makes the Kahala one of the most desirable locations for not only brides to be, but many of Hollywood's rich and famous. The Kahala Hotel is a mixture of Hawaiiana with mid century mod, reminiscent of the days when Elizabeth Taylor and Frank Sinatra frequented the Hotel. It is one of the few hotels that have managed to maintain that luxury and impeccable service that was so inherent in hotels during the days of old Hollywood. As professional wedding photographers in Hawaii, the Kahala is one of our favorite locations for wedding photography. We marvel at the gorgeous open lobby with giant chandeliers of Italian fused glass. We adore the spiraling orchid staircase that showcases the dozens of rare orchid breeds in a living wall. While the inside of the resort is immaculate, we absolutely can't get enough of the 800 ft stretch of white sand beach we have all to ourselves in the late afternoon hours. While those are some of our favorite spots, the resort boasts of waterfalls, dolphins, gazebos, and hosts the largest hotel suite in Hawaii measuring in at 550 square feet! There are endless photo opportunities to capture you and your beloved ones for that magical day. If you are looking for a picturesque location for a wedding where you can feel pampered and catered to, look no further than the Kahala Hotel & Resort. People from around the world come to celebrate their marriage here and theres no question as to why. - Written by Julia J. Originating in Italy decades ago, wedding vow renewals have been becoming more and more of a popular trend amongst couples within the last few years here on the beautiful Hawaiian Islands. Whether you’re nearing your 5th wedding anniversary or 50th, renewing your commitment to your loved one is a fabulous way to celebrate a milestone. With Hawaii being one of the top locations for a destination wedding and honeymoon, why not celebrate your wedding anniversary with a vow renewal in paradise? Make it a fun event by ordering similar flowers to your original wedding and encourage your honey to get dressed up with you! If you plan on inviting your friends and family to your event, a vow renewal is a perfect excuse to update your family photos! At Coral Weddings, we are here to capture all things love and marriage. What better way to commemorate your day than with candid photos of the ceremony and family portraits to follow? Coordinate with your professional photographer in putting together a shot list with what you would like to have captured. You’ll be thankful for the memories of your Hawaii vow renewal. Kauai is home to the honeymoon of your dreams. What better way to begin your lives together than on the romantic island of Kauai? With numerous sights to see, Kauai offers an unforgettable way to start your life as a married couple. The Boston couple chose "The Garden Island" as their honeymoon destination. Kauai is Hawaii's oldest and most scenic island, resulting in beautiful backdrops for photos. 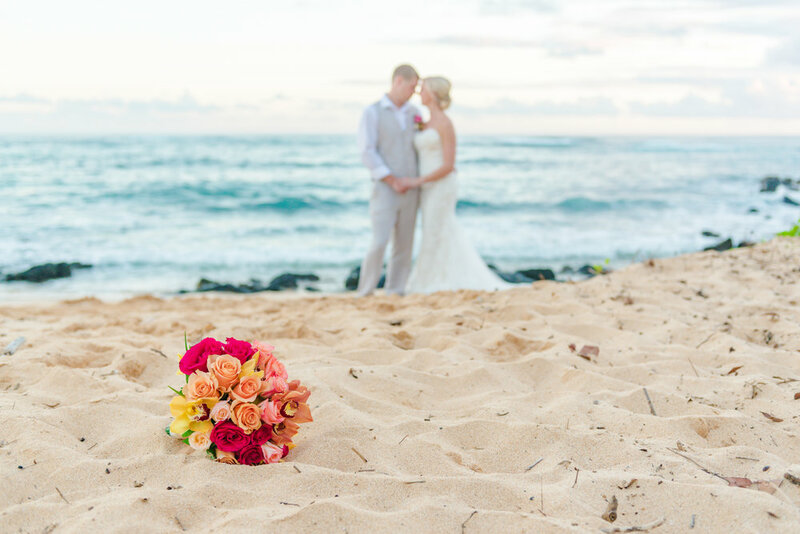 Emily expressed interest toward Coral by Pacific Dream Photography to capture memories of her and her husband for their Hawaiian vacation. The newlyweds opted for a sunset shoot on the scenic grounds of the Grand Hyatt. Not even a cloudy day could stop them from having a fun filled photo session. Here at Pacific Dream Photography, we are prepared for the variety of weather Hawaii has to bring. Believe or not, Kauai is one of the wettest places on earth! Lucky for us, we are located on the sunniest side of the island, Poipu. It's no wonder why Poipu, Kauai is called "The Sunny South Side." Saturated in sunshine all year round, this part of the island allows us to capture bright and fun images. Patrick and Emily adored their candid beach photos, as well as their dreamy garden images. Not only did their passion for each other stand out in every photo, but also the whimsical backdrop of Shipwrecks Beach resulted in radiant photos. The sea and sky melted into sapphire blue, as the "just married couple" focused on the effortless tropics of Kauai. The happy couple's family and friends cherished the meaningful gift of the photos. Photos capture the significant milestone in a couple’s life and share and experience of Hawaii with loved ones. Honeymoon photos make for a monumental souvenir and a well-remembered trip. If you’re considering spending your honeymoon in Kauai, you’re in for a special treat. Enjoy each and every moment in the exquisite paradise of the island. We absolutely adored capturing Zac + Kate's beautiful romantic wedding last month at the Andaz Maui. From the intricate details of Kate's dress, to the incredible lush arrangements on the reception tables, we love telling our clients' stories of their special day through our lens. Residing on the South-West side of the beautiful island of Maui, the Andaz is located in the quaint town of Wailea. One of the advantages toward having your wedding in an exclusive location such as this one, is the intimacy that comes with it. Destination weddings are becoming more and more popular for the couple that's looking to escape to paradise with just a few of their closest family and friends to celebrate their love. Allow us to enhance your wedding experience with our team of professionals capturing every moment from your day.